From Ancient Greek δαρεικός (dareikós), from an Old Persian word related to 𐎭𐎼𐎴𐎡𐎹 (daraniya-, “gold”), from *𐎭𐎼𐎡 (dari-, “golden”) (compare Avestan 𐬰𐬀𐬌𐬭𐬌‎ (zairi-, “yellowish, golden”)), ultimately from Proto-Indo-European *ǵʰelh₃- (“gleam, yellow”). Compare Aramaic דריכונא‎ (drykwnʾ), Classical Syriac ܕܪܝܟܘܢܐ‎ (drykwnʾ), Biblical Hebrew אֲדַרְכּוֹן‎ (adarkon) and Parthian 𐫅𐫀𐫡𐫏𐫃‎ (dʾryg /dārīg/, “gold coin, Dareikos”). Considered by classical authors to be from Δαρεῖος (Dareîos, “Darius”) who standardized the coinage as such, but this is a folk etymology. 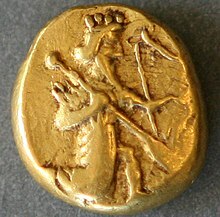 A gold coin from Persian Empire, introduced by Darius the Great (522-486 BC) and used until Alexander the Great's invasion (330 BC).